We have never cared about accessible hotel rooms, as they do not really help Mik other than the roll in shower. Plus, Mik finds handicap raised toilets harder for him. 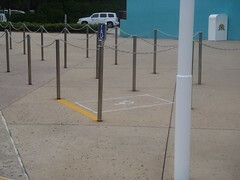 Also, we have heard the accessible rooms are in high demand at Disney World and others actually need them. 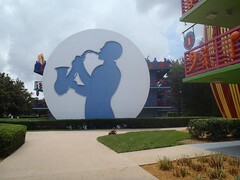 Thus we never even tried to get an accessible room for the All Star Music Resort. It was not horrible without, but i certainly would not stay there again without an accessible room. As a budget hotel the rooms are extra small. We have stayed at budget hotels before, but never anything this small with Mik. 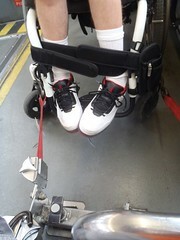 The room was barely big enough to have a place to put the wheelchair anywhere you wouldn't trip over it. It certainly could barely fit anywhere past the area near the window and door, as the bed was so close to TV stand. Luckily Mik preferred to relax on the floor and take a break from his chair anyways. The bathroom is not that big, but that was expected and not really an issue. I was just surprised at the limited area to move about the room. We liked that to get to the food court the building had motion sensor sliding automatic doors, so no need for a button. The same type of doors lead out to the buses from the lobby. The food court was sometimes hard to navigate through with the crowds and minimal space in the ordering area, but there is plenty of seating and the service was great. One day Mik got a taco salad and because he could not see what the toppings and such were the CM went through the options one by one asking if he wanted that on his salad. Plus, since he didn't want certain things she gave extra of the things he liked. First thing we got at the food court was refillable mugs. They costs about $15 each, but you get unlimited refills during your stay and we certainly got our money's worth out of them. The bus transportation to the resorts worked our pretty good during our stay. There are lines depending on where you want to go and most have a line specifically for wheelchairs. However, a few do not. We did not wait in the regular line for those without one, as they still need to load the wheelchair first and that did not make sense to us. Instead we found waiting by the sign for these lines worked fine. 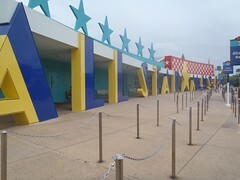 Note that sometimes the buses arrive full still needing to drop off passengers at the All Star Movie resort and you end up having to wait for the next one. Also, I noticed every once in a while Cruise Line buses were being used. These buses are not the ones with lifts. Luckily, none of the times it affected us, but I felt bad for the two people who had been waiting for a bus that still had to wait when I was leaving Magic Kingdom one night by myself. However, it does seem these are added in addition to the regular ones to help when the bus lines get long for certain routes and accessible ones still come around at normal intervals. 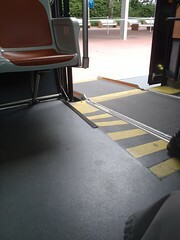 Most buses are kneeling buses with ramps that flip out. However, some are still old style with a lift. All can accommodate at least 2 wheelchairs/scooters and some can handle 3.